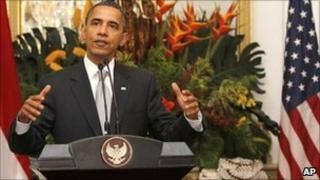 US President Barack Obama has criticised Israeli plans to build some 1,300 settler homes in East Jerusalem. Speaking in Indonesia, he said neither the Israelis nor the Palestinians were making the extra effort needed for a breakthrough in stalled peace talks. The chief Palestinian negotiator has urged the international community to recognise a Palestinian state in response to Israel's latest plans. The row over settlements has caused the re-launched peace talks to break down. The Palestinians are refusing to go back to the negotiations without a stop to settlement building on the territory they want as their future state. Constructing settlements on occupied Palestinian land is illegal under international law, but Israel disputes this. Palestinian leader Mahmoud Abbas has previously floated the idea of going to the United Nations to declare statehood as one option if peace talks collapse, but only after seeking support from Washington. Speaking in the Indonesian capital, Jakarta, President Obama said Israeli settlement building was "never helpful when it comes to peace negotiations". "I'm concerned that we're not seeing each side make the extra effort involved to get a breakthrough that could finally create a framework for a secure Israel living side by side in peace with a sovereign Palestine," he added. The Palestinians meanwhile, said the world must recognise Palestinian statehood in response to Israel's decision to build the 1,300 new homes in the East Jerusalem settlements of Har Homa and Ramot. "This latest unilateral Israeli act necessitates dramatic international action for immediate recognition of the Palestinian state [based] on the 4 June 1967 borders," chief negotiator Saeb Erekat said in a statement. Also on Tuesday, reports said a further 800 units were planned in the settlement of Ariel in the northern West Bank. Israel's announcement on Monday has sparked widespread condemnation from the US, UN, European Union and Russia. EU foreign affairs chief Baroness Ashton said the plan "contradicts the efforts by the international community" and "should be reversed". "Settlements are illegal under international law, constitute an obstacle to peace and threaten to make a two-state solution impossible," she added. Israel's Interior Ministry has said that the announcement was procedural and it will take years to build the homes. Direct peace talks, which resumed in Washington in September, quickly ran aground after an Israeli moratorium on West Bank settlement construction expired later that month, prompting the Palestinians to freeze talks until Israel re-imposes the ban. US Secretary of State Hillary Clinton is expected to raise the issue with Israeli Prime Minister Benjamin Netanyahu in New York on Thursday, the White House has said. The Israeli leader is on an official visit to the US this week. But his office released a statement late on Tuesday dismissing the criticism. "Jerusalem is not a settlement, Jerusalem is the capital of Israel," it said. "Israel sees no connection between the peace process and planning and building policy in Jerusalem." "The disputes with the United States on the matter of Jerusalem are known," he added. "We hope to overcome them and keep diplomatic talks moving ahead." Israel has occupied the West Bank, including East Jerusalem, since 1967, settling close to 500,000 Jews in more than 100 settlements.